This is reposted from my blog. I will cross post my articles from there to here and am more than open to discussion on the subject. 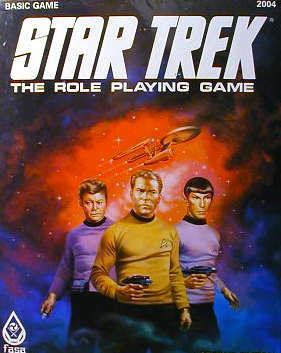 My roleplaying began at the same time as my love of Star Trek via the FASA Star Trek RPG. 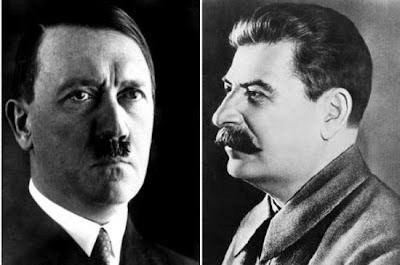 The two came hand-in-hand and even introduced me to one of my best friends who still plays in my regular campaign all these years later. This has over the years given me a rather unique view of Star Trek, that does not necessarily conform to that of either the TOS Trekker, the Movie Era Trekker, the TNG+ Trekker or even the new JJ Abrams Trekkers. For me, if I had to take a moniker it would be that of a FASA Trekker. There is a feeling to the FASA Trek universe that I just feel happily connected to. I love almost everything about it, though the game system is a bit dated, and can say that it truly, more than anything, created a Star Trek universe that I can honestly see happening. To be more specific, I like the Movie Era period, set within the FASA Trek universe. You know? 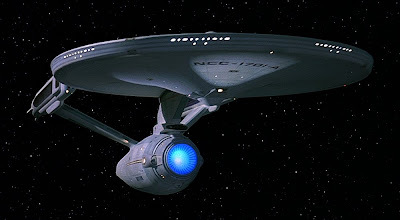 That thing on the front of the Enterprise is a sensor dish and NOT a magical do-it-all navigational deflector. The Federation uses credits and the Klingons... oh the Klingons! Well that will be a post for later, but let me just say Kai JM Ford! So then, what is Ultimate Star Trek? Basically it is my amalgamated Star Trek Universe designed for role-playing. Over the years of Star Trek, between various series, rpgs, fan books, et al, the idea of Star Trek has changed. Sometimes dramatically. I can't say that I enjoyed all of it either and of late I have noticed a rather steep decline in the enjoyment I have been getting from official Star Trek product. One day I noticed that Marvel Comics had begun to revamp their universe with a side set of comics called Ultimate (Ultimate X-Men, Ultimate Spiderman, etc). 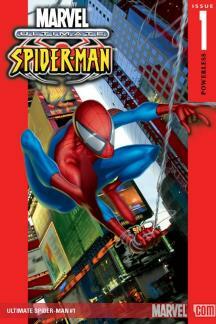 In these comics each the basics remain identifiable, but the flavours, specifics and such have changed. It struck a chord in me. What if I could do this with Star Trek? What if I could "cherry-pick" the stuff I liked and make it all into one cohesive"alternate" universe? Thus Ultimate Star Trek was created. Do I think my vision of Star Trek is better than anyone else's? Of course not. It is just more to my tastes and my desires. Most of it comes from other sources and not me. That means I respect and enjoy the creations of others and have co-opted them into this game. All respect and credit where due. In the end I think Star Trek has become as much a part of literature and western mythology as Shakespeare's works or Lord of the Rings, but like Shakespeare's works, I believe it is open to interpretation, adaptation and change. Your mileage may vary. If you believe that the canon of Star Trek is absolute, then you will probably not like this page at all. It is so very far from canon and proudly so. • Star Fleet of the 23rd century. • The timeline of the Ultimate Star Trek universe. I hope you will enjoy these posts, and as always feel free to ask me questions about it as I go along. Much like ships, the uniform is a very important part of everyone's Star Trek experience. 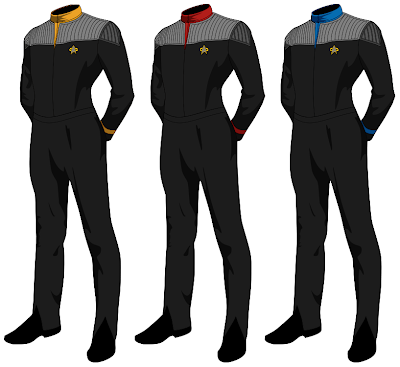 Certainly the vast amount of fan designs, as well as the options on Star Trek Online shows that there is no one "universal" Starfleet uniform. My all-time favourite uniform are what the fans call the "Monster Maroons" from Star Trek II - VI. They certainly were a diversion from the old TOS tri-colours and a light year from the Motion Picture's tenis outfits and pajamas. Still, as much as I love them, I find maroons to be a bit dated and a bit awkward as a regular duty uniform. That said I will not abandon the look, but I will be using a variant of it. More later. So what uniform to use? 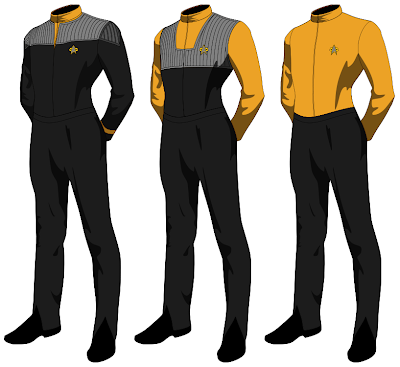 Well it is a simple choice for me, my second favourite of all time in Star Trek history are the First Contact uniforms (also used on DS9). These uniforms have a nice balance of classic Star Trek as well as a slight militaristic look without seeming too military. They fit Ultimate Star Trek perfectly. Now I want to take this moment to remind the purists out there that is this Ultimate Star Trek, the one that I most want to see, not a canon universe by any stretch of the imagination. Just so we are all nice and clear. So remember earlier when I said I would use the maroons in this version, well here we go. I found this image while searching Deviant Art. I had, had this idea for a uniform years ago but lacked the artistic skills to create it. 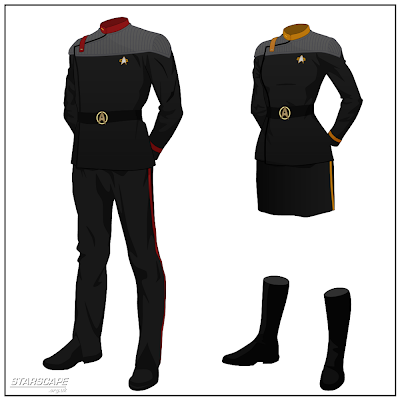 I was so very happy to find this image and will use this design (with pants as an option of course) as the Class A uniform, which would be for me between Dress Uniform and the Class B duty uniform shown above. 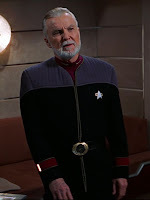 Admirals will use the lovely one that we saw in Insurrection and later as I think it is quite Admiralish, without being insane looking like the TNG Admiral's uniform was. I am unsure if I want them to have department colours or go the Wrath of Khan way and give them the command white, showing that despite their assignments, they are the Admiralty and as such above departments. Also I will be bringing back the concept of Commodores, I really loved having something between Captain and Admiral and that works perfectly. 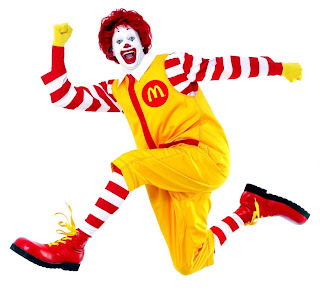 They will remain with their department colours and wear a slight modified uniform as shown here. 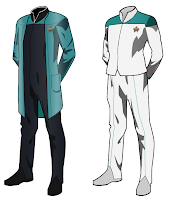 Now some of you will not like Commodores, but I like them just fine and I guess I should warn you now that I also like the idea of the rank Fleet Captain, who would wear the same uniform as a Commodore. 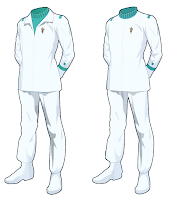 So now that we got the uniforms solved, everything should be just fine right? Not by a long shot, cause now I am going to mess with the departments. I hated it when TNG swapped Command Gold for Operations Red. 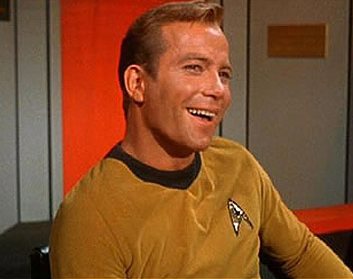 To my mind there was a pride in being a "Red Shirt" and they just got rid of it. Made me sad. Another issue is the ever changing Medical/Sciences colour. At the start it is blue, then it becomes teal and at one point was even a sort of aquamarine. Le sigh. Now, since this ISN'T the Next Generation, I still think there are more clothes for Starfleeters to wear, and here are some of them for your pleasure. There are others I might add as I find them but for now that should cover the gamut of what I want for uniforms. P.S. All these images were found using Google image search and I take no credit for them other than maybe tweaking the colours here and there. AslanC wrote: This is reposted from my blog. I will cross post my articles from there to here and am more than open to discussion on the subject. Do you want to give us the url for your blog so we can follow along there too? 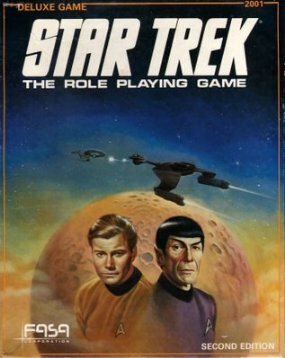 An interesting and useful way of looking at Trek, especially for those who RPG and write fan fiction. I thought about it but then decided that I was going to catch up all the posts (and edit them) here and then post the new ones here as well. "Come, come, Mr. Scott. Young minds, fresh ideas. Be tolerant." - Admiral James T Kirk. 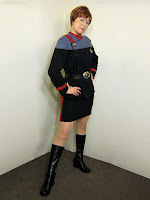 I would be remiss if I didn't include a more thourough break down of the Class B Duty Uniform. I will do this from time to time, just add uniform options for example. So the uniforms are in the bag, for the most part, so next up is the other most important part of Star Trek that is always very personal. Yes'sir it's time to talk about starships. Specifically the ships of Starfleet. That's the deal for me, the movie gen of starships is what I think of when I think of Star Trek. See that blue thing at the front? It is NOT a "Navigational Deflector" it is a "Sensor Dish", which is why the Enterprise is such a good science vessel. Think about it, the Reliant doesn't have one and is unable to detect human lifeforms on Ceti-Alpha V. I bet the Enterprise would have found them right quick... but I digress. Now which is my favourite Starfleet ship? Yarp! The Reliant is my baby. In fact the USS Athena (NCC 26282) was the first ship I ever commanded in a Star Trek campaign and she will always hold a special place in my heart. Now the other thing I love about the movie era of ships is that between FASA Trek, modellers and fan artists, there is literally hundreds and hundreds of designs to draw on allowing for a diverse and exciting Starfleet! There you have it... Oh right... I promised you a word on NCCs. First up it is the name that matters, not the number. So no 1701A or any of that nonsense in Ultimate Star Trek. Second is that NCC, in Ultimate Star Trek stands for Naval Construction Code, indicating this is the number assigned to the ship on the day she leaves drydock. More on why I choose deployment later. Much like Stardates, nothing generates for fan discussion than the purpose and sequencing of NCCs. FASA took the ideal that each Starship class had a similar numbering scheme (IE; all cruisers are 1000 - 1999), but that doesn’t hold up due to on screen evidence that showed us Connies with NCCs as low as the USS Eagle’s NCC-956 and as high as the USS Intrepid’s NCC-1831. Too be fair though, FASA did list the Eagle as 1738, the later one comes from a chart in Star Trek VI. At first I figured since this was Ultimate Star Trek I could just retconn the whole thing and make it work. 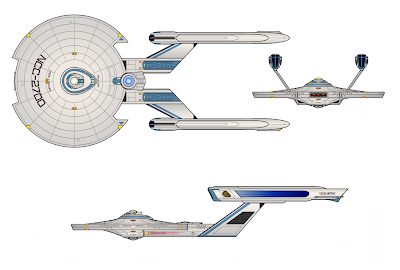 But then I started wondering why the USS Excelsior would be NX-2000 and other ships could be later 2100 and 2200. Confusing just a tad and required heavy handed reasons. Not making me happy it was. My other first choice was to decide that the first batch of Connies, 14 in all, would have sequential hull numbers as they were ordered up in a batch. So with a rough guideline I add in this variable; the USS Constitution (NCC-1700) is commissioned in 2225, a difference of 63 years since the Daedelus. That averages out to about 27 ships a year, leaving 300 more to be commissioned by 2249. With 300 more ships to be commissioned in the next 24 years (taking us to 224) that gives us about 13 ships year. If we take 23 ships a year from 2162 to say 2200 we will be at NCC-874. That means to jump the next 826 ships by 2225 we need to see production increase to 33 ships a year. Again these are not absolute numbers, just guidelines. We have wars in this period that would require more ships built in those years, and less in the non-war years. Still given this basic numbering we can, through a little math, figure out roughly when a ship would be deployed. A ship with the NCC-1821 would be commissioned roughly in 2235, since we know from the timeline that the USS Miranda (NCC-1800) entered service in 2234. Again this is not exact science, but certainly something that can be used as a guideline. So the question becomes do we go by commission or deployment? Those deployments might go faster during wartime and slower during peacetime. So from this point on, we will use deployment as it is an easier and more solid point of reference. A ship might be commissioned up to 5 years before being constructed and that would throw a monkey wrench into the whole works. The notable exception is the Excelsior, since she was hailed as “The Great Experiment”, I measure her NCC from commission. So in conclusion, while not an exact science, it does give a basic idea and as they say “Is close enough for government work.”. 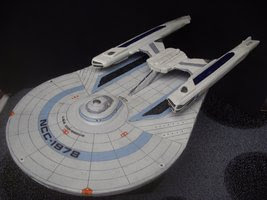 As a side note I should mention that the term NX has only been used 5 times on screen (USS Enterprise NX-01, USS Dauntless NX-01-A, USS Excelsior NX-2000, USS Defiant NX-74205, USS Prometheus NX-59650). 4 of those times are not canon for Ultimate Star Trek, but the 5th (and the original) is very much so. NX-2000 was meant to show a great experiment Therefore I agree with certain camps that suggest like the rank of Fleet Captain, NX designations are rare and very very special. Ships that break new ground and change the norm deserve this, not simply the first ship in the line. Of course your mileage may vary, but that is why I made Ultimate Star Trek, to have a playground for my ideas. This is awesome. Although I haven't ever played FASA, I love the way you have envisioned this so far. 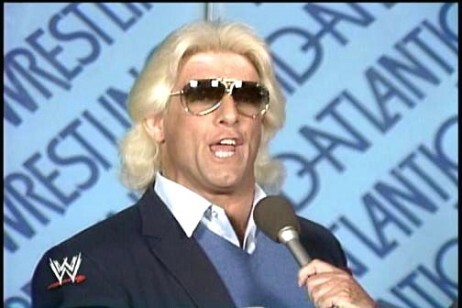 I found your blog elsewhere, and though I didn't read it extensively, I am interested to see how all of this develops! If you ever want to bounce ideas off someone, I'd love to hear your thoughts. j_kendall wrote: This is awesome. Although I haven't ever played FASA, I love the way you have envisioned this so far. I found your blog elsewhere, and though I didn't read it extensively, I am interested to see how all of this develops! Ultimate Star Trek: Who Boldly Goes There? Captain Derp to the bridge! No clever caption, just two shades of evil. ...but I digress. I have a point to make and it is this. When designing the Ultimate Star Trek universe, I felt the need to take the famous missions of the USS Enterprise and divide them up amongst the captains of ALL the Constitution Class Cruisers, showing that of course those ships were in the hands of the literal "best & brightest" Starfleet (I prefer this spelling) had to offer. Yes a few of them do go mad, space is a pretty horrifying place when you stare into the endless black (Firefly had my fav take on that... well up until Serenity... but again I digress), but the point is that not just ONE ship saves the day or does everything. Some of you won't like this, but hey... Ultimate Star Trek... remember? I will post the timeline soon and I hope you all enjoy it! Fascinating! I absolutely love the old school feel of all of this. I don't RPG but this is awesome!